Giant African Land Snails can measure between 10 – 20cms long depending on the species. They are nocturnal which means that they are usually inactive during the day. Owners must provide the correct accommodation, heating, humidity, lighting and food to ensure that the snail remains healthy. Without the proper care they can suffer with skin, shell and digestive issues. Giant African Land Snails need a well-ventilated glass or sturdy plastic tank with a secure lid to stop them climbing out. The tank should be kept out of direct sunlight and away from radiators and draughts. Indirect sunlight in the room will avoid the need for the tank to have specialist lighting. The tank must be big enough – ideally 60cms long, 45 cms wide and 40cms high – and a 5cm layer of peat substitute should be placed on the floor. This must be kept damp. Giant African Land Snails need to be kept at a temperature of 24 – 30 degrees centigrade to maintain normal growth – this can be achieved with a heat pad placed under the tank and a vivarium heat bulb may also be necessary. Owners need to monitor the temperature and humidity regularly as if a snail becomes too hot, cold or dry they will become inactive and even dormant. A very shallow water bowl should be placed in the tank – snails can drown in just a few millimetres of water. Not only does this provide drinking water but also helps to keep the environment humid. The inside of the tank should also be misted with warm water every other day. The walls of the tank should be wiped regularly and the tank given a thorough clean in plain water once a week. Avoid using any chemicals as snails can absorb these through their skin. The peat substitute layer should also be changed every week. When cleaning the tank or handling the snails, bear in mind that these animals can carry diseases that are harmful to humans, such as Salmonella. Good hand hygiene is important when looking after these animals. 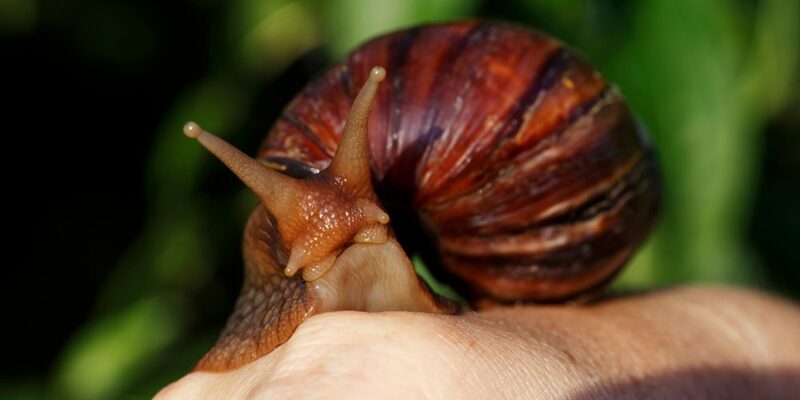 Giant African Land Snails will eat many leafy greens – lettuce, spinach, cress and watercress, dandelions and grass but make sure that they are free from chemicals (pesticides, fertilisers etc). They will also eat cucumber, courgettes, apples, melon, grapes and bananas. Cabbage can be fed, but this often causes unpleasanr odours. Food should be washed and chopped. It is best to have a shallow feeding bowl to prevent the floor of the tank getting messy. Any food left after 24 hours should be removed from the tank. It is important that Giant African Land Snails consume calcium to maintain their shell. This can be provided by a cuttlefish bone, natural chalk, crushed eggshells or a calcium supplement which is sprinkled onto their food. A Giant African Land Snail is not an easy pet. They have complex needs mainly revolving around their environment and diet. Giant African Land Snails are very susceptible to dehydration from overheating or direct sunlight. Because they absorb chemicals through their skin avoid using any chemicals including fly spray and room freshener anywhere near them as it can prove fatal. A healthy snail will have a clean, unbroken shell with no lumps, bumps or small white patches on its skin. It is better to obtain snails from a captive-bred source and avoid wild-caught individuals. Wild snails can carry parasites which may affect humans, but these are not present in captive-bred animals. Luckily most snails available in the UK are captive bred.